The Switch, as it stands, is an unmitigated success both commercially and critically. Developers are flocking to release their games on the system as soon as they can, but just how many games have been released in the first year of this console's life? Short answer, 404 in Western territories. That's over 100 more than the N64 got in its entire life! You could just look at them all on a Wikipedia list, but to try and put this into perspective we had the hugely impractical idea of showing off every single one of these games in the video above, rapid-fire style. For me personally this has really opened my eyes to the sheer volume of the Switch's library. Having to sit there and read out the title of every single game and think about the work hours that have gone in to creating them all is a little bit flooring to say the least. Make sure you check out the video above, because blimey did it take an age to put together. Hello there lovely Sweople! Well done Alex for getting through that. Some absolute classics there, some absolute stinkers too. What's the game(???) between Cartoon Network: Battle Crashers and Cat Quest? I'll take a look on Wiki. It was Castle of Heart. I wonder if any game slipped through the cracks and isn't listed on Wikipedia. If there's 404 games released in the west that means I own exactly 25% of them,2 on cart and 99 downloaded.That's crazy, or perhaps I am? Probably a bit of both.I dread to think how much money I'll have spent on this console by the time the next gen comes around. Thank you for all the lovely YouTube content this past year Alex Olney. I enjoyed every single moment of it. Here's to a stellar second year for Nintendo Switch! @GrailUK Absolutely barren. A wasteland. Bereft of software. Digital tumbleweeds. And 2018 has all the hallmarks of being twice as bad. @WiltonRoots Totally. I just don't see where their 2018 game of the year is going to come from. Last year they had 2! Unacceptable. And out of those 404 games released on the switch, how many were developed or published by 404 games? I noticed that the ACA arcade games don't get mentioned. 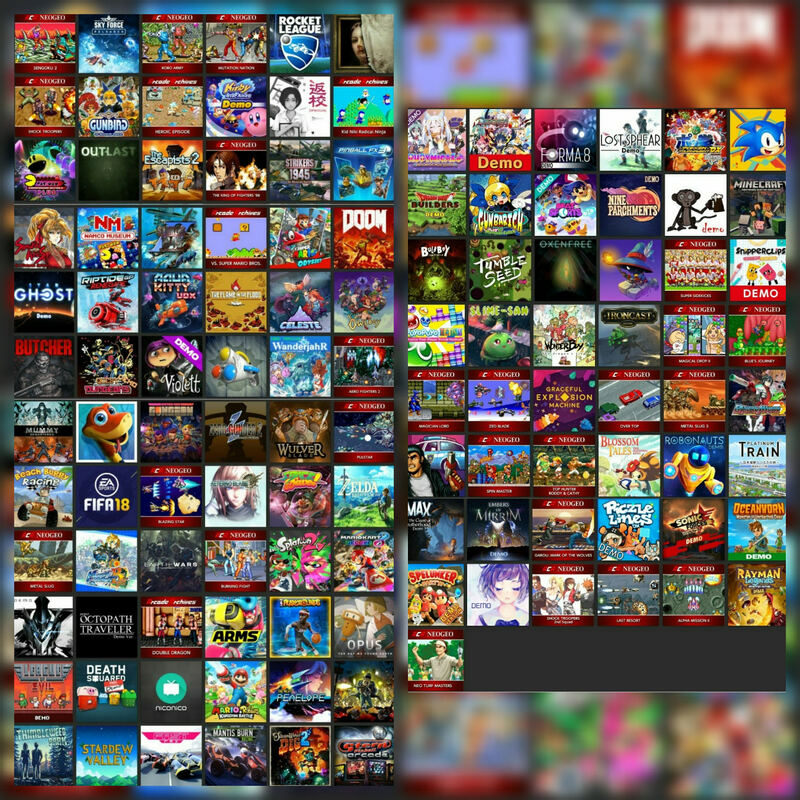 404 Nintendo Switch games standing before me, but i only have 14 empty spots. These spots represents the games that will be chosen to become Nintendo's Next Top Games. I will only call 14 Nintendo Switch games and the games that I do not call must immediately return to the developers and leave from competition. When you consider that the Switch averaged at least one new game every day last year, I’d say that’s fairly impressive. @OorWullie Let's get a list of them. Is there a limit for the number of games you can installed on the Switch? For 3DS you can only install 300 games. I have to delete a lot of games to install new ones. "You just do the singing. I'll take care of the hard part!" Another great video, @AlexOlney ! Keep doing what you're doing! If someone could, I'd be interested to know the total number of games there are minus the Indies. The Indie scene is growing rapidly. It didn't exist on Gamecube, there was a tiny bit on Wii, it grew a fair bit on Wii U and now on Switch they've exploded bigger than they have ever been before. Edit: I did a rough calculation and I counted 60 games that are not Indies out of 404. And that included counting games like Bayonetta, Bayonetta 2, Resident Evil: Revelations and Resident Evil: Revelations 2 individually. And others as well like Snipperclips and Snipperclips Plus, even though it's an Indie game, it's published by Nintendo. But nobody's mentioned this fact. 85% of the games on Switch are Indie titles. So when Alex says the Switch has more games in its first year than the lifetime of the N64, that's fine, but there's a big fat Indie elephant in the room. Let's go even further. Of those 60 1st and 3rd party games, the majority are ports and most have added nothing new. Then there's that article from yesterday. Some Indie games were published physically, some 3rd party games weren't. So again, out of the 404 games, only about 1/4 were published physically. And a lot of them were done so in very limited quantities with overly expensive price tags. Yes, there are some top quality Indie games but there's far more muck than gems. Nobody talks about this either. Edit: Another factor to consider when comparing the N64 era to now is that if you wanted to sell a game, it had to be produced physically. That's not the case today. You had to buy a certain allocation of cartridges. Now you can just bung a game on the eShop if you want. There's no overheads, production costs of boxes, manuals, cartridges, shipping, etc. Which leads on to patching. A game had to be properly finished back then. And you'd live or die by what was on the cartridge. Now developers can put out an unfinished game to meet a deadline and come along later and patch it up. Cartridges were crazy expensive back then and it seems those days have returned. Only watched half so far, here's what my brain registered. I'll watch the rest later but I'm assuming it will just go something like this. Just realized my brain didn't register "Mario + Rabbids Kingdom Battle" that's weird it's a long name it should have stood out. Maybe I have the name wrong. Edit: Yup it's in there, right where it should be, guess my old feeble mind just couldn't process it all. Or maybe it's his inflections, I'm watching it low on my mono tablet, don't want to wake anyone early on a Saturday. Its a lot of games, but honestly it feels weighted veeeeery heavily towards indie pixel based 2d titles. Of course, some of those titles are fantastic, all time classics. Axiom Verge for example. But there is a lot of shovelware and overpriced phone ports there. Remove the ports of games I already own for other consoles and PC and it feels a little thin so far. Mostly a Mario Odyssey machine for me. Still positive about Switch though. Looking forward to Yoshi and Kirby this year, Metroid whenever, and hopefully mainstream (new) Pokemon, Smash and Mario Kart games. @Nincompoop you have more than 300 3DS games? 404 Switch games... I have 7. Loooong way to go. @ImDiggerDan You still have a chance for the sequel! That number is less impressive if you check how many (hint: almost all of them) of those 404 games are ports though... porting an existing game takes a lot less effort/time/ressources than starting from scratch, after all. The N64 didn't have that many ports, so that comparison doesn't really make sense. Stopped watching when I instantly realized this was being read in alphabetical order and not chronological order. Could you redo the video in game size order? "The switch doesn't have any g---"
404 error: complaint not found. But but, the drought! Yada yada cardboard, yada yada ports(that I’ll buy on the Twins but complain about Nintendo), yada yada why doesn’t Nintendo realize I’m the only gamer on the planet?! Also a money complaint somewhere in there. Seriously if you can’t find anything to play on switch it’s time to move on. @SLIGEACH_EIRE Castle of Heart isn't out until 23rd March. @antster1983 It's the game listed between those 2 on the Wikipedia page. It may have been edited out of the video so. Nintendo haters will eat their words now. They realized they were Wrong. @Ryu_Niiyama You forgot mandatory downloads, because no other system ever requires a download to play a physical game. @SLIGEACH_EIRE So... by your reckoning, indie games aren’t games? Or shouldn’t count as games as they are published digitally? 404 games is majorly impressive by any count, especially in the console’s first year. As an aside, do you own a Switch? Or even like Nintendo, as all your comments are always negative, which is rather bizarre for a Nintendo site. @AlexOlney Great selection of screenshots in that video, Alex - I was watching thinking "Ooh, I like the look of that one... and that one... and that one..." for virtually every game. 1:35 Wrong screenshot! That's actually 'Premium Pool Arena,' not 'Billiard.' Oh well.. fine effort. @AlexOlney Quick question: it is Xeodrifter or Xenodrifter? Very impressive video though. Kudos. @SLIGEACH_EIRE Tbh the Switch is perfectly suited for for indie games and I know you're not doubting that. I love a great game and if I can get one for $20 or less I'm all the more happier. I've bought more games for one System this last year then any other year ever. Those $20 to $30 price tags sure help that. I also don't have the time for some of these longer $60 games. I probably finished more games over the last year then any other as well because of the shorter games. @gortsi You can use SD card of any size, where have you been? List didn't include ACA Neo Geo. I think. @gortsi I was going to answer your question but @Nincompoop beat me to it. I might not have phrased it in quite that way, however. Also, you don't need to worry about getting a huge card because you can use multiple cards and switch them in and out just like physical carts; whenever you want to play a game put in the card it's on. (Nintendo says to turn the Switch off first, and not to just switch cards like you can carts; I see no reason not to believe them.) Nothing happens when a card holding a game isn't inserted other than the obvious one of not being able to launch it. Did he say golf story? @JimmySpades We are talking about the 3DS, not Switch. @gortsi When 3DS came out in 2011, 32 GB was the biggest SD card size, that's why Nintendo said it was the biggest card supported. @gortsi I can assure you that it works, just format it as FAT32 and it will work. maybe I missed it but I didn't hear Monster Energy Supercross. There's too much indie garbage on Switch. Just look at the multiple articles Nintendolife publishes about indie games. Too much. @LUIGITORNADO Hey, I’d say that the overall quality and quantity of games for the Switch is great. No real shovelware, well except Troll and I. @JasmineDragon haha. I’ve taken so many dinner breaks or have gone to bed on the Twins I'm incredulous still. @AlexOlney This was amazing. Please do a new version of this every time a new game is released. Not an update. I want you to re-record the entire thing. You can do it! 2018 is looking kinda dull compared to last year. Nintendo really did set the bar incredibly high for me. E3 2018 better be worth it. It's more than 404 games if you count the "Arcade Archives" releases. The 58 Neo Geo games and 8 arcade games that are also available on Switch weren't mentioned in the video.